Signature Day Program offers creative expression and learning opportunities for adults with intellectual and developmental disabilities. Programs include College and Career Readiness classes in collaboration with Western Piedmont Community College, the arts including painting, music, graphic art, theater, pottery, fabric, and mixed media. We are a member of a professional art cooperative, West Union Art Studios, located in downtown Morganton, where we sell our artwork. We also sell one-of-a-kind ceramic artwork and clay flower pots at the seasonal Morganton Farmers Market. Our computer skill building and journalism program produces the "Signature Speaks" newsletter, distributed quarterly to families, guardians, and community stakeholders. Employess of Signature Day work to promote a supportive work environment, assist people to explore their creative potential, develop their unique talents and gifts, and profit from their experience. 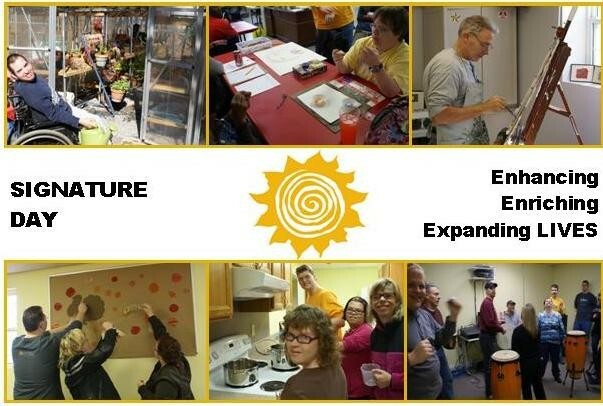 Our goal is to provide meaningful activities that enhance, enrich, and expand a person's life.